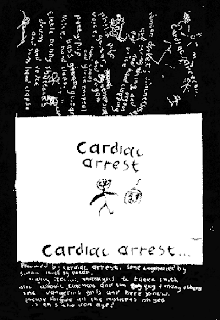 Long one of England's best kept musical secrets, The Cardiacs might be considered something of a cult musical institution in the U.K. (where they evidently scored some brief chart success back in the 80's), but at least here in the States, their public profile has largely been nil. My introduction to these giants among men was via their career capping 1999 effort Guns, a jaw-dropping and thoroughly unholy marriage of Propaganda-era Sparks, Queen, XTC, Koenjihyakkei, Uz Jsme Doma and the soundtrack to The Rocky Horror Picture Show. 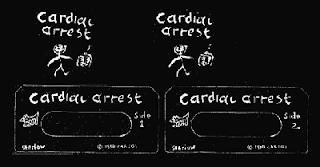 These earliest recordings of theirs, dating from when they were known as Cardiac Arrest (circa 1976-1980...an E.P. from this period was included in one of my singles posts) affect a far more scrappy and rough hewn D.I.Y. posture than their latter day efforts but, despite the expanse of time between these recordings and Guns, the aesthetic thrust of their project has remained remarkably consistent. Right from the start, these folks were intent on dissolving the boundary distinctions between prog and punk, their workings closing the gap between the UK festival crusties and travellers and the post punk brigades. Long unavailable, this as-yet-unreissued tape material from their salad days is as good a point of entry into the Cardiacs mystery school as any and a vital piece of the puzzle for fans of these inspired madmen. Thanks to Dominique for this one. Their second tape "Toy World" will follow shortly. Thanks! Cardiacs are one of my all-time favorites! wonderful! always wanted to hear this one since i've seen the sleeve pattern on shane embury's (napalm death) tshirt! and i like it better than their work as cardiacs. thank you! If you like the tunes here, go to their website and check out the Garage Concerts vol 1 & 2 - songs from Obvious Identity and Toy World, and other early material, updated to super new-millenium performance standards.